Details on how to enter to win a copy of this book at the end of this post. 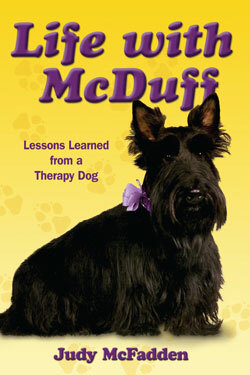 McDuff is a Scottish Terrier who came to the author, Judy McFadden, as a puppy. There is nothing as cute as a Scottie puppy; all head, eyes dancing with mischief, they steal hearts in an instant. The book chronicles McDuff’s the road from puppyhood to becoming a certified therapy dog, a path that is not common for Scotties, with a lot of emphasis along the way on the author’s personal struggles. Like Judy, I had a Scottie that was also a certified therapy dog, so it was easy to relate to McDuff’s therapy visits and the people he and Judy met along the way. Chapter ten, entitled Project PRIDE at Opportunity Village, really nails the essence of what pet provided therapy can do, especially for the most challenged among us. At Opportunity Village, Judy and McDuff meet a number of severely challenged young adults who are locked in nonfunctioning bodies and/or minds. Finding a way to relate to these people is probably the most difficult assignment for a pet therapy team. Visiting senior facilities, library reading programs, even VA Hospitals usually have an obvious route for the therapy pet to interact with the residents or patients: heads in laps, snuggling on the floor with a child while he or she reads, or just sitting by a senior while she pats the therapy dog and reminisces about her own long ago pets. When you are tasked with visiting people who seem to be locked away, that calls for great patience. Therapy pet handlers who elect to do this kind of therapy–like Judy with her dog–deserve special praise, for they are doing work that many could not do. In such cases, the pet must carry the largest share of the load and actually make the connections. McDuff does this. In the case of one young man with hardly any refined motor skills, McDuff instituted a game of fetch by placing the ball in the man’s hand. The throw was minimal, but McDuff fetched the ball and brought it back again placing it in the resident’s hand. Nathaniel responded with big smiles amazing the staff, visiting families, and everyone looking on. The following chapter about a children’s reading program called Reading to Rover describes how therapy dogs help children, often with self-esteem issues, who are reading below grade level. Once again, McDuff excelled at making connections with the children. He even developed a strong bond with one young boy that extended beyond the reading sessions, helped the youngster to raise his grades and spent time with the boy’s entire family. For anyone with a dog, especially a Scottie, there are many interesting parts to McDuff’s story and even if you are not part of pet provided therapy, you will probably relate to many of the adventures described in the book. However, Scotties to me are very special dogs. They are truly big personalities in a small package. I have had Scotties since 1990 including my wonderful Frosty who was a certified therapy dog and with whom I did therapy visits for ten years. I understand both pet therapy and the Scottie personality. Unlike some other breeds, Scotties do not live to simply please their people. They are stubborn and independent. What’s in it for me is a phrase we Scottie folks often use to describe our dogs. Those of us who know and love the breed see these characteristics as positives and a key part of the Scottie mystique. Yet, we do not ignore these qualities. For instance, we know that Scotties should never be off leash except in enclosed or fenced in areas. That is why the author allowing McDuff to be off leash in a strange field at night or at a hot air balloon race was upsetting to me. We also know that Scotties, like all dogs, have a digestive track that is canine and not human. Feeding McDuff candy, peanuts, and cough drops as the author did, is very ill-advised. In addition, Scotties and all dogs should not ride unrestrained in a car as did McDuff. They should always be in the back seat away from air bags and either in a crate or belted securely into a seat. Clearly McDuff was a very special little dog who beautifully defined the wonderful possibilities that come with the canine-human partnership, and I would have loved seeing more of the focus on McDuff. To enter to win a copy of Life With McDuff, simply email KRL at life@kingsriverlife[dot]com by replacing the [dot] with a period, and with the subject line “McDuff,” or comment on this article. A winner will be chosen March 16, 2013. (This contest is for longer than usual because of the second event) U.S. residents only. Excellent piece by Lee, as always. McDuff looks adorable. Good information, not only about what works but what doesn’t. It’s great to read about the miracle visits but also needed, is to know just how hard some of them are.